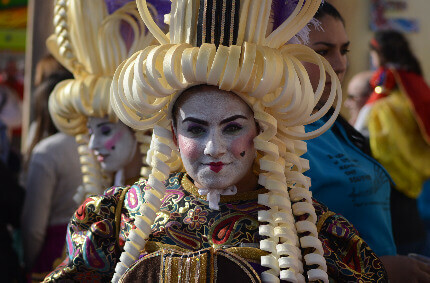 Carnival in Malta brings you details of the carnival activities for three main locations on our islands. Take the opportunity to enjoy these occasions with your family especially with children. The local carnival history dates back since the Knights of St. John came to our islands and they are so much loved by the Maltese. Opening ceremony, followed by competitive dancing by Companies C and D and a Costume Parade. Competitive dancing by Companies A and B, followed by a small defilé featuring the King Carnival Float, grotesque masks, satirical floats and Category A floats. 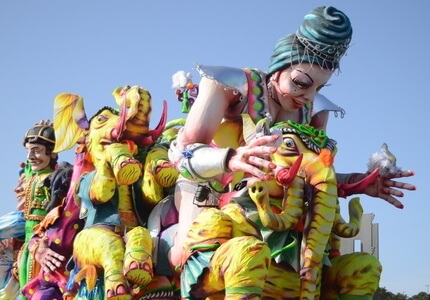 The Children’s Carnival programme starts with the participation of dancing companies from private schools, Companies C, followed by a small defilé with the participation of the King Carnival Float, individual grotesque masks and satirical floats along Republic Street. Another programme starts with the participation of competitive dancing Companies A, B and D, and Triumphal Floats from Categories A, B and C. Following this, a parade will proceed up Republic Street. A theatrical production produced by Teatru Malta. ‘L-Għarusa Karfusa’ is the classical tale of banned love – between a fruit and a vegetable. Triton 18 Carnival Ball will take place around the fountain outside the city entrance. All Carnival companies and the public are invited. The event will feature local DJs and a live performance by the Big Band Brothers. The event will carry on till late. A carnival parade featuring the Ħamrun bands, organised by the Ħamrun Local Council in collaboration with Festivals Malta, will take place in the main street of Ħamrun. Carnival Floats Parade at Castille Place, Valletta. The defilé will proceed via the Granaries, Great Siege Road, Floriana, Glormu Cassar Avenue, Castille Place, Merchants Street, Archbishop Street, St John’s Street, Republic Street, City Gate, the Triton Fountain Area, Sarria Road and St Publius Road, Floriana. The programme starts in St George’s Square and sees the participation of Category C Companies followed by a defilé featuring the King Carnival Float, grotesque masks, Companies D, satirical floats, Triumphal Floats A, B and C and Company Floats Category A. Following this activity a defilé will proceed up Republic Street. A Children’s Parade with the participation of private dancing schools from Malta and Gozo as well as Category C companies. Starting at St George’s Square and parading through Valletta, the event will culminate with a performance by all companies back in St George’s Square. The programme opens with a show by dancing Companies A, B and C in front of Castille. It is followed by a defilé with the King Carnival Float, grotesque masks, satirical floats, Triumphal Floats A, B and C and Companies on Floats Category A and closes with a defilé which will proceed up Republic Street. At 10am there will be a Children’s Parade with the participation of private dancing schools and groups from St George’s Square through Republic Street. It will end with a show at Pjazza Teatru Rjal, which will also include a performance from Zhejiang Wu Opera Troupe from China. The King Carnival Float and his retinue of floats, and dancing companies in costume celebrate around Floriana, culminating in St Anne’s Street, Floriana, for the final defilé. Zhejiang Wu Opera Troupe will also be performing. Defile’ along Republic Street to Independence Square (It-Tokk). Dancing spectacle with the participation of dancing companies together with triumphal floats, grotesque masks, “Il-Komittiva” & special guests of Maltese dancing companies, Big Friends Guggen Musik Malta and TAMA TNABAR. Defile’ along Republic Street to Independence Square (It-Tokk). Dancing spectacle with the participation of dancing companies together with triumphal floats, grotesque masks, bands, “Il-Komittiva” & the representation of il-“QARĊILLA” by Teatru Malta, Big Friends Guggen Musik Malta and TAMA TNABAR. Defile’ along Republic Street to Independence Square (It-Tokk). Dancing spectacle with the participation of dancing companies together with triumphal floats, grotesque masks, “Il-Komittiva”, and “Sambrazilian” – a Maltese/Brazilian band. Grand Finale along Republic Street to Independence Square (It-Tokk). Dancing spectacle with the participation of dancing companies together with triumphal floats, grotesque masks, and local band. Organised activities on the Sunday 4th February. The spontaneous Carnival between Friday 9th to Tuesday 13th February.